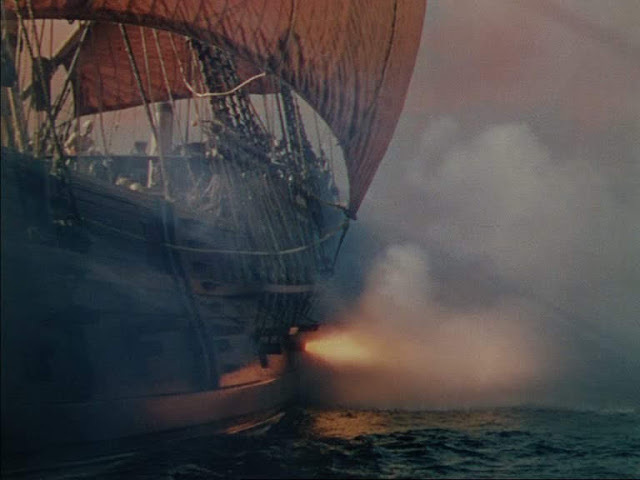 Nominated for an Academy award Special effects. 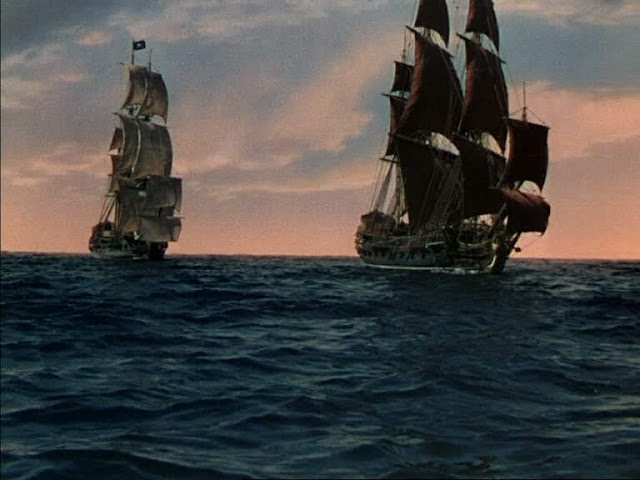 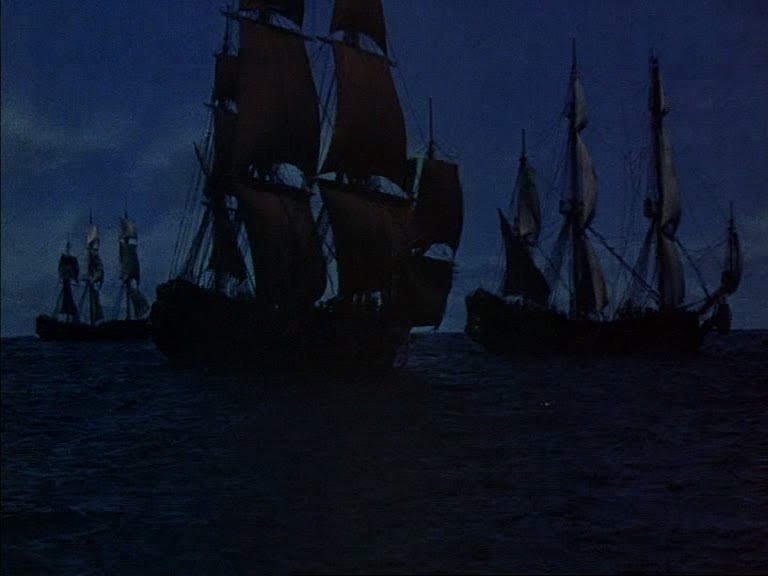 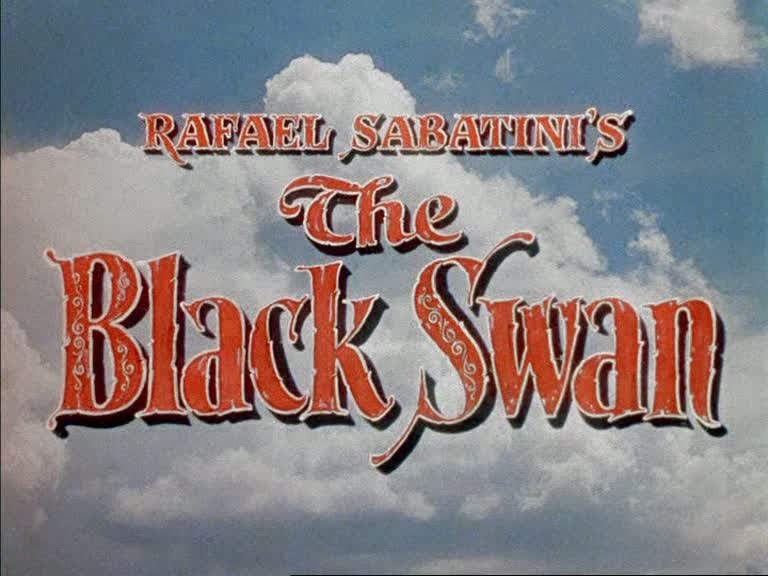 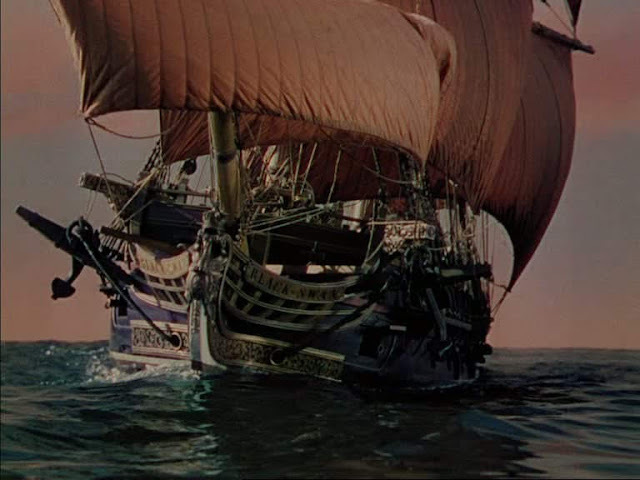 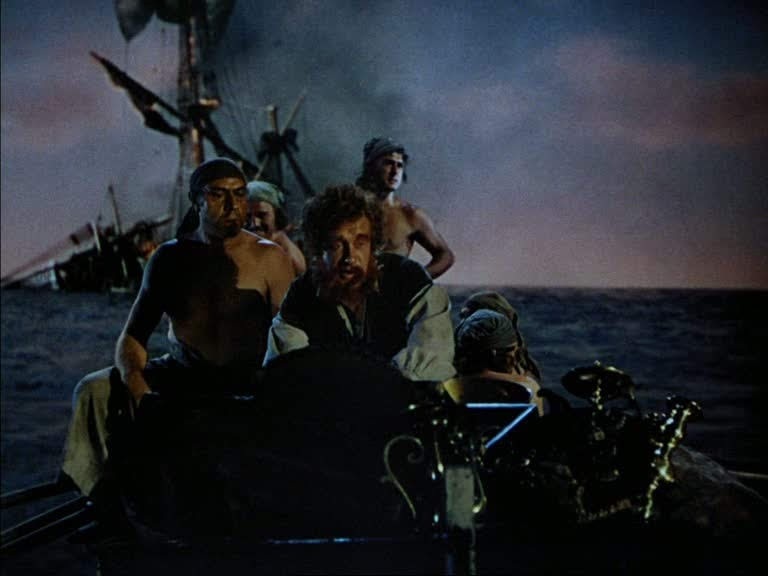 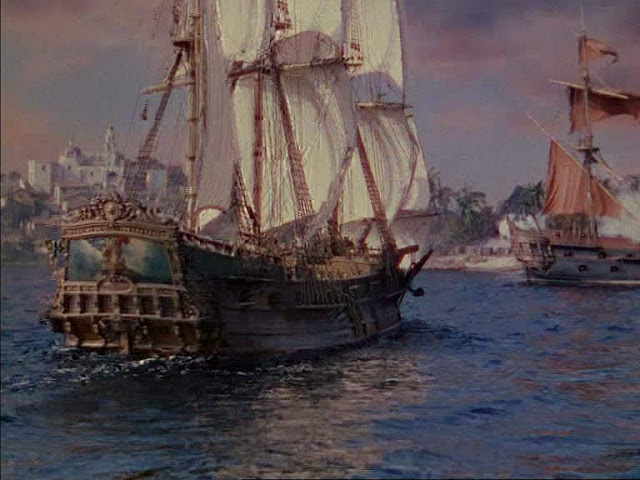 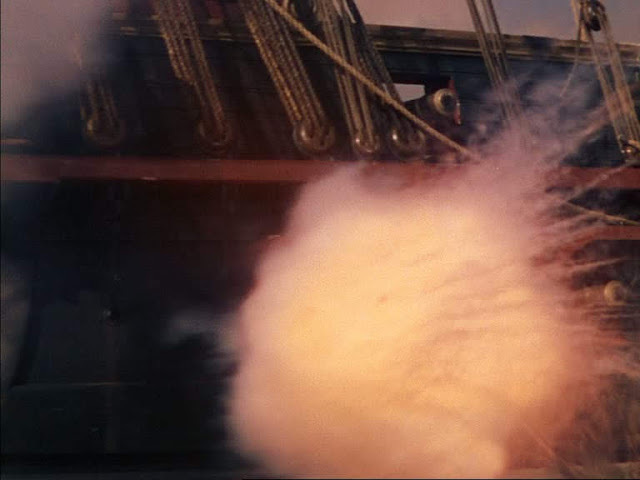 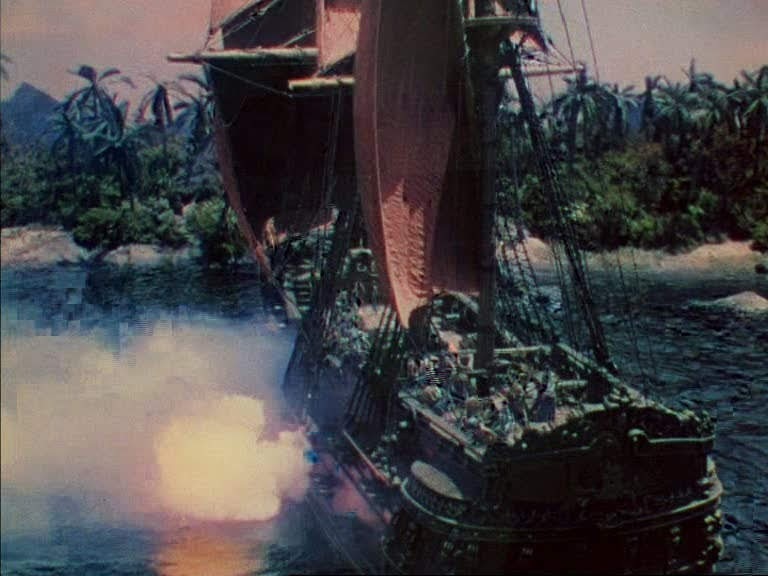 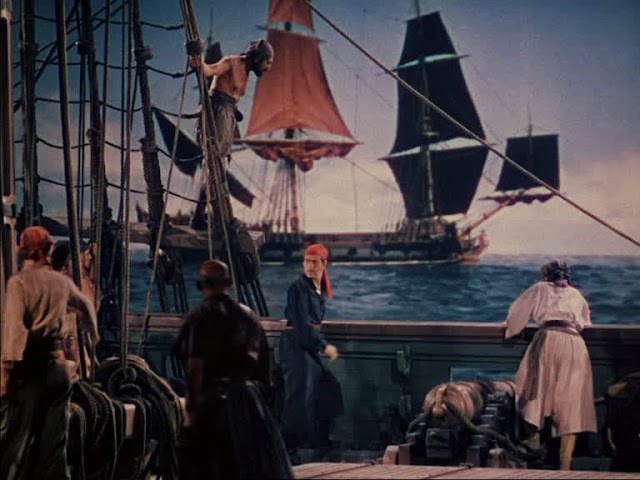 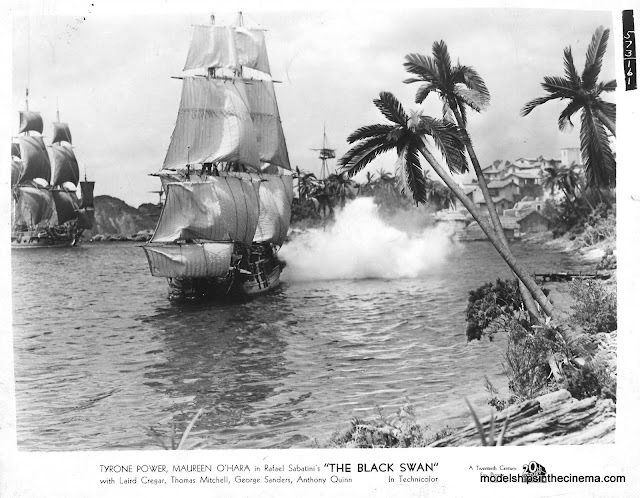 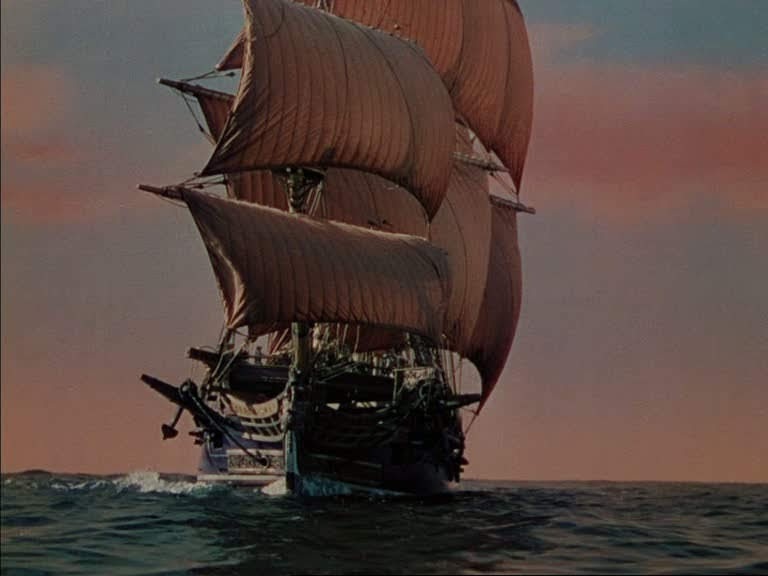 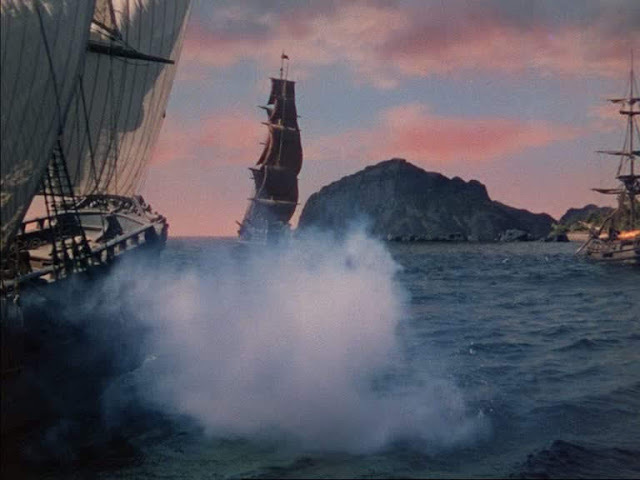 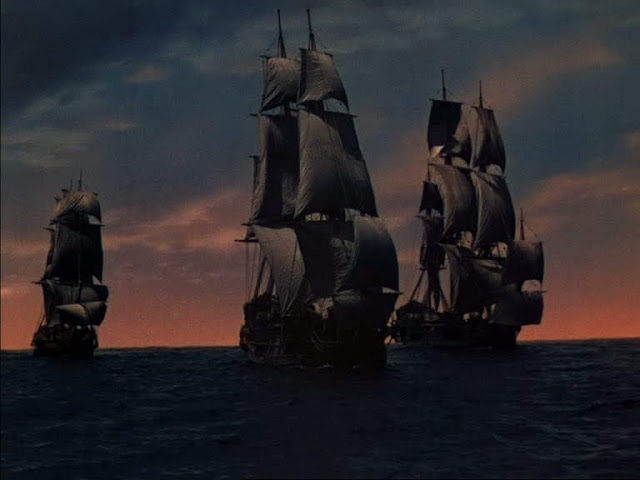 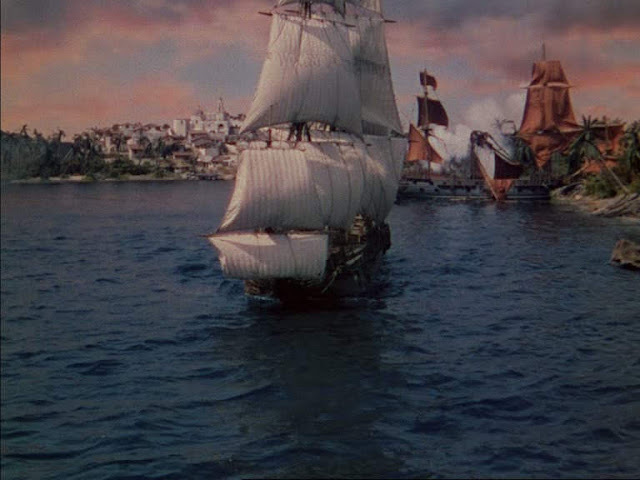 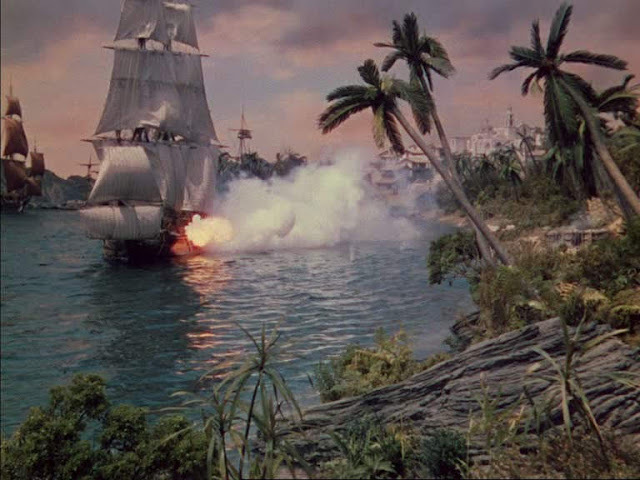 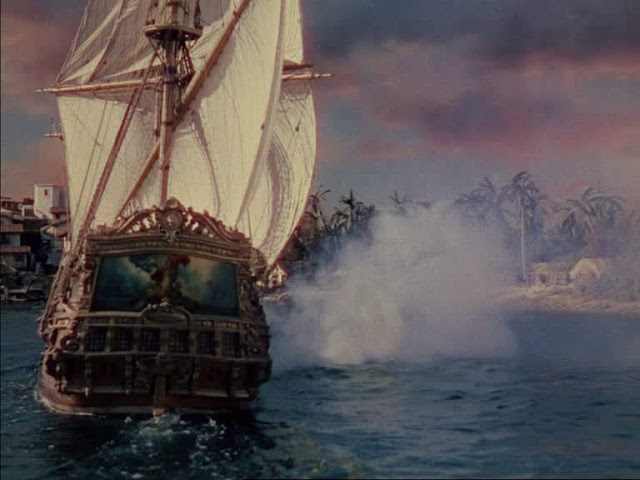 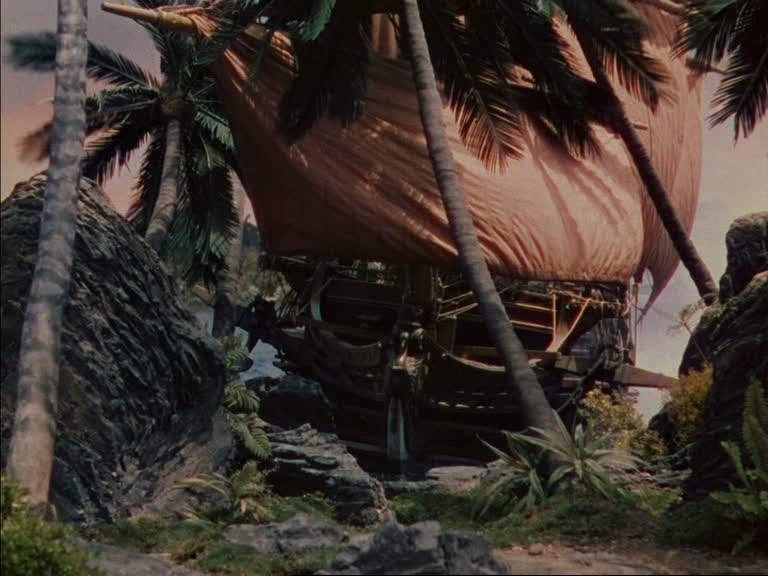 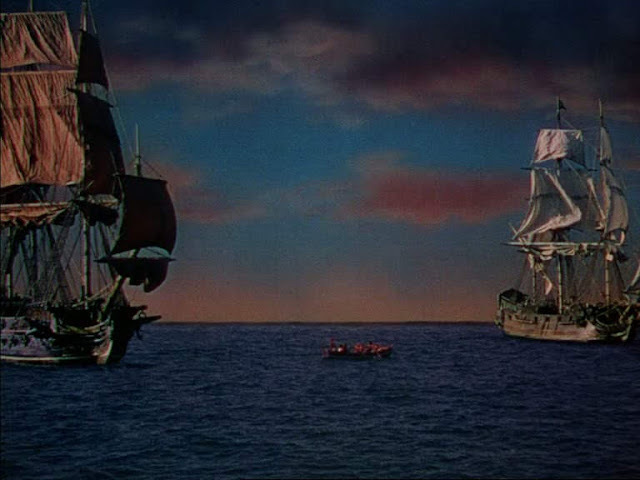 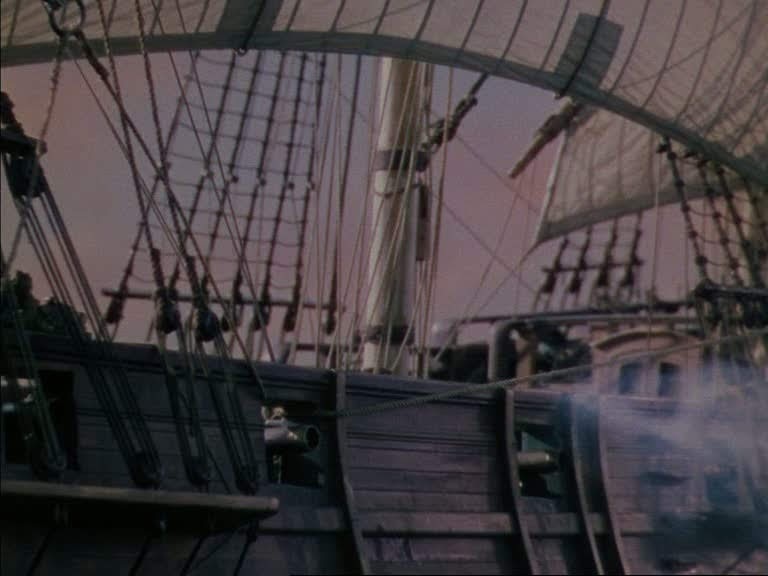 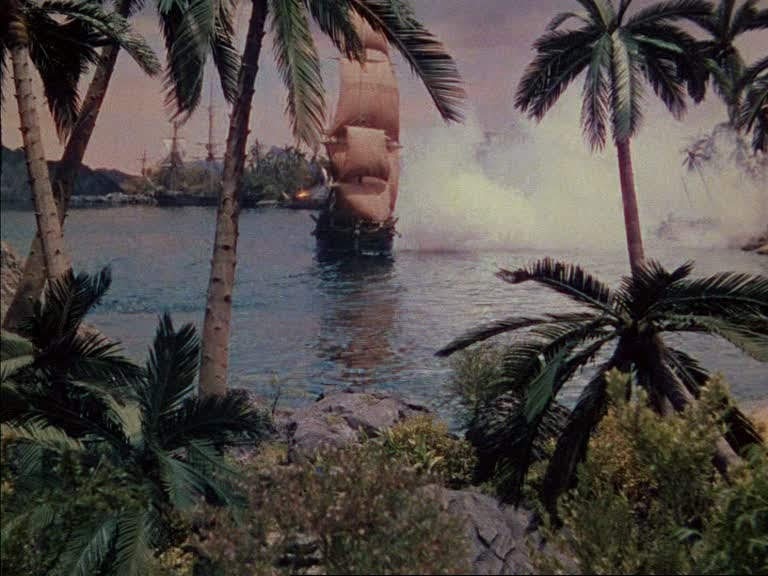 A more colorful Pirate movie will be hard to find, with the Technicolour cranked up to 11. An uncredited Fred Sersen delivers some terrific model ship action complete with a miniature bay and harbour that comes under attack. 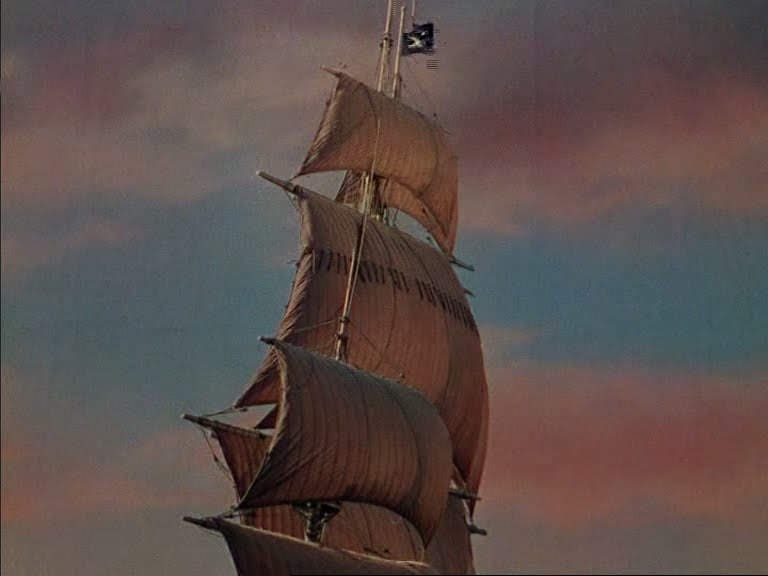 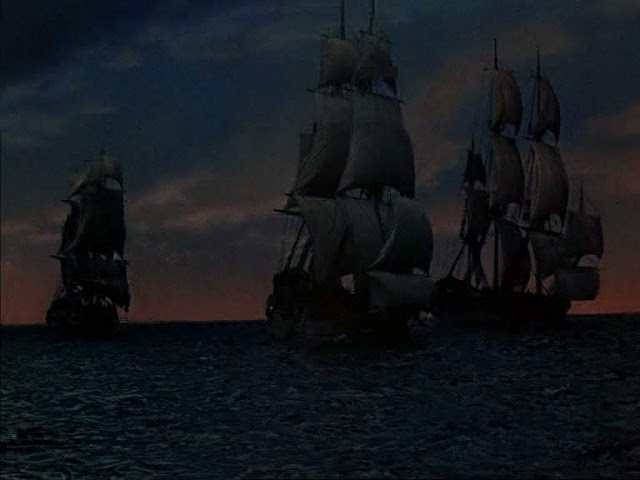 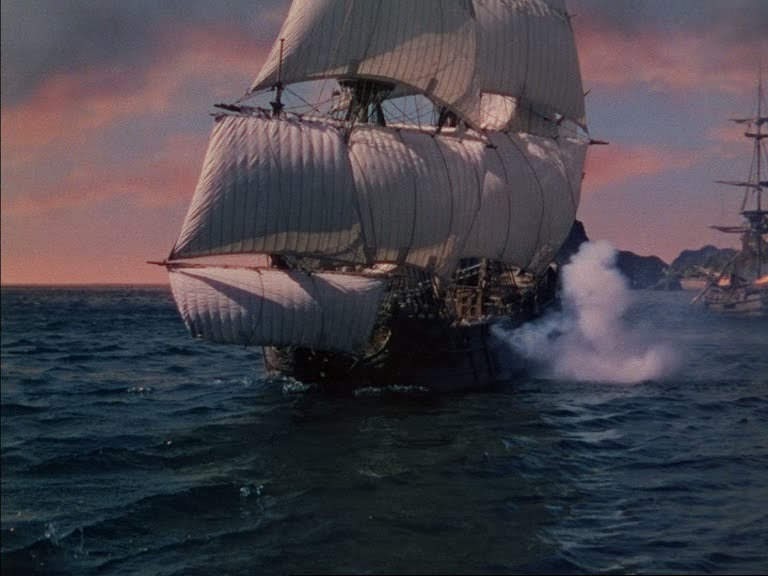 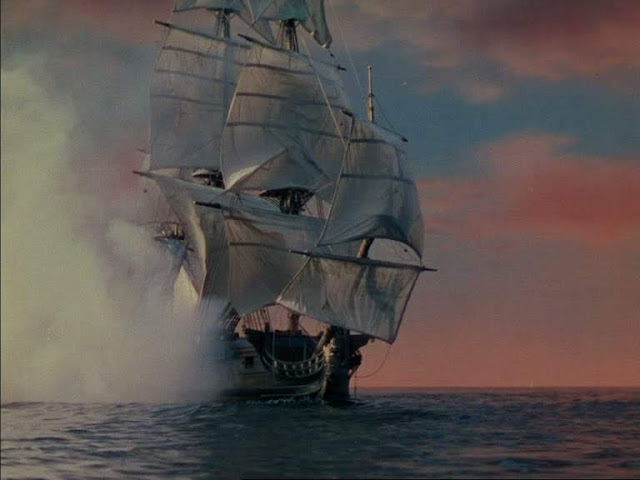 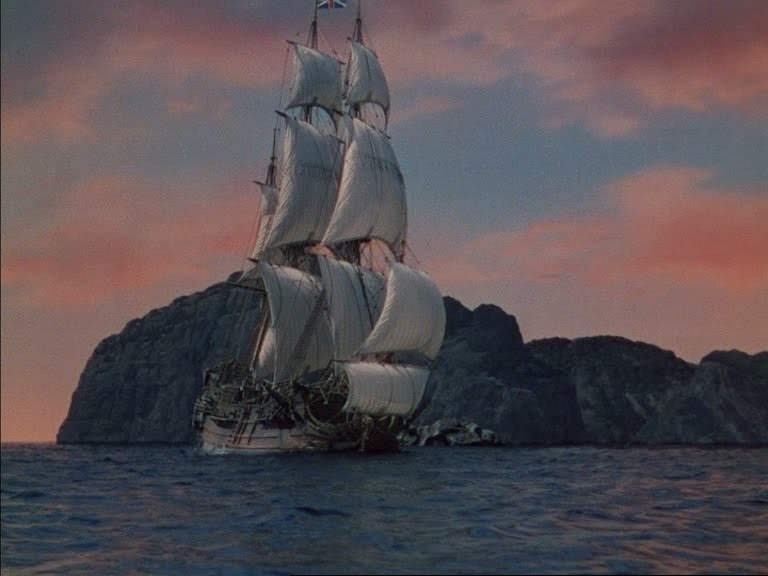 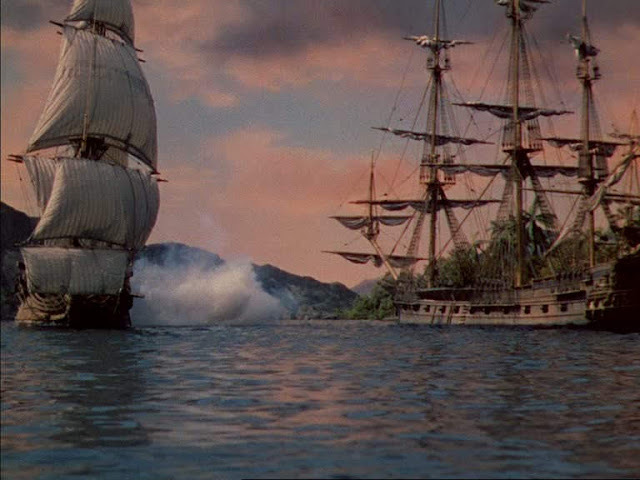 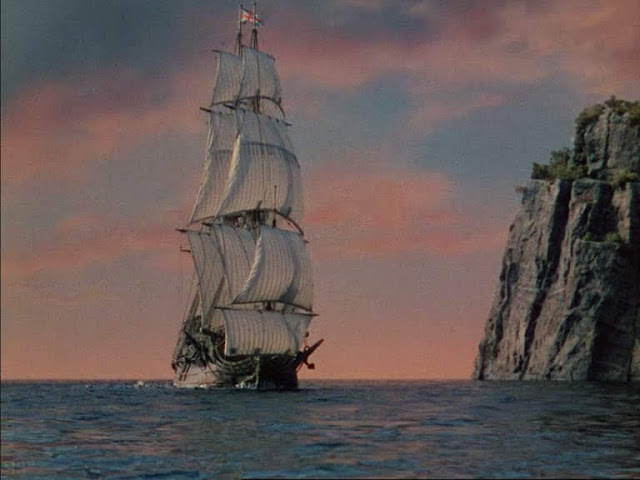 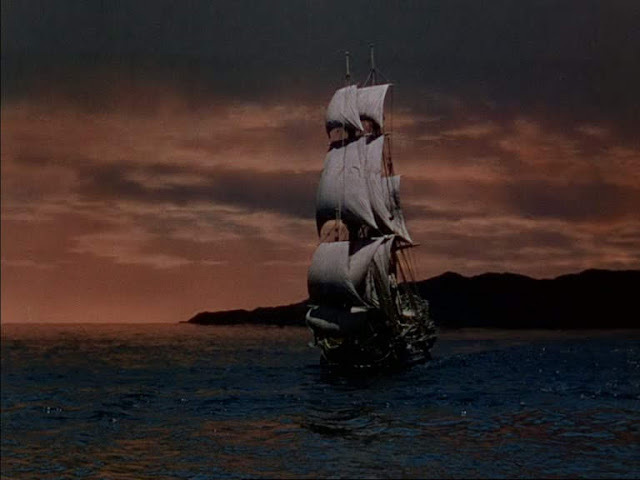 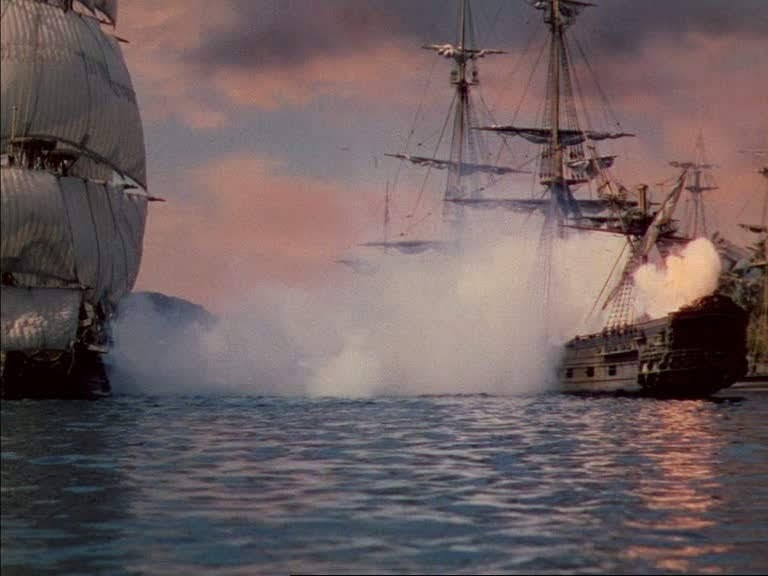 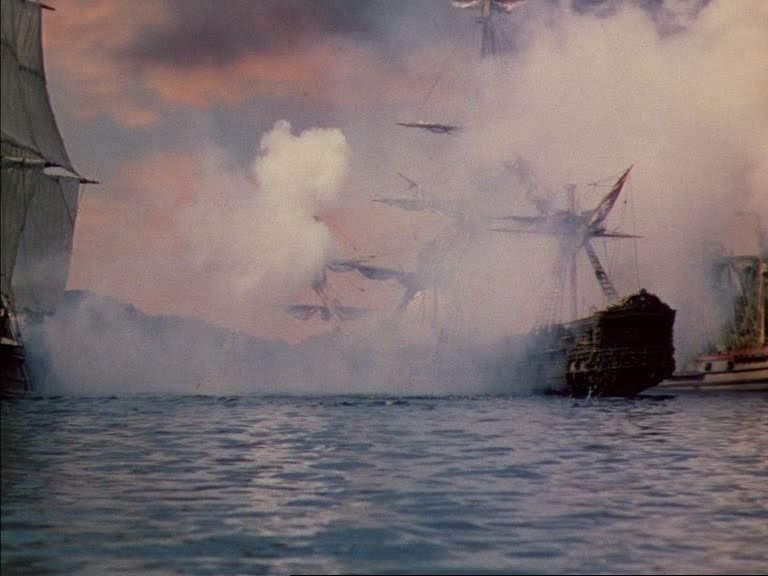 According to IMDB the ship is the same one as used in "That Hamilton Woman", "The Princess and the Pirate" and "CaptainKidd" a title now in the puiblic domain. As can be seen the main ship model is really finely detailed, in particular the miniature sails which display some detailed construction in the close shots. 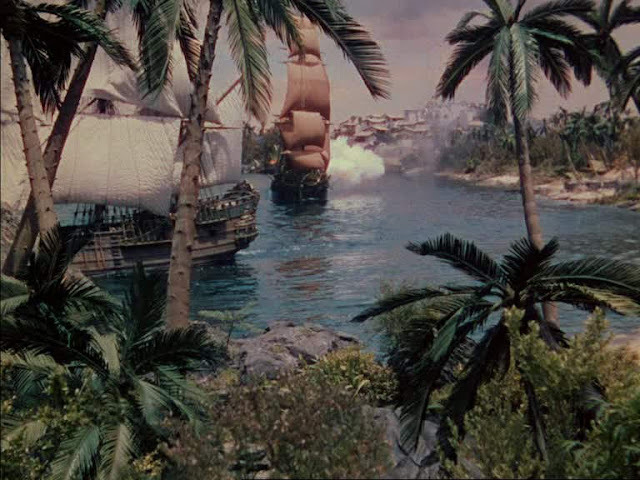 There are a few examples of miniature shots being used for Rear projected backgrounds. 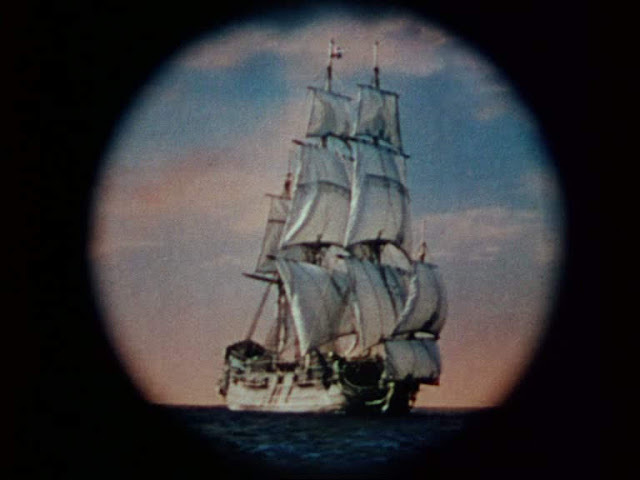 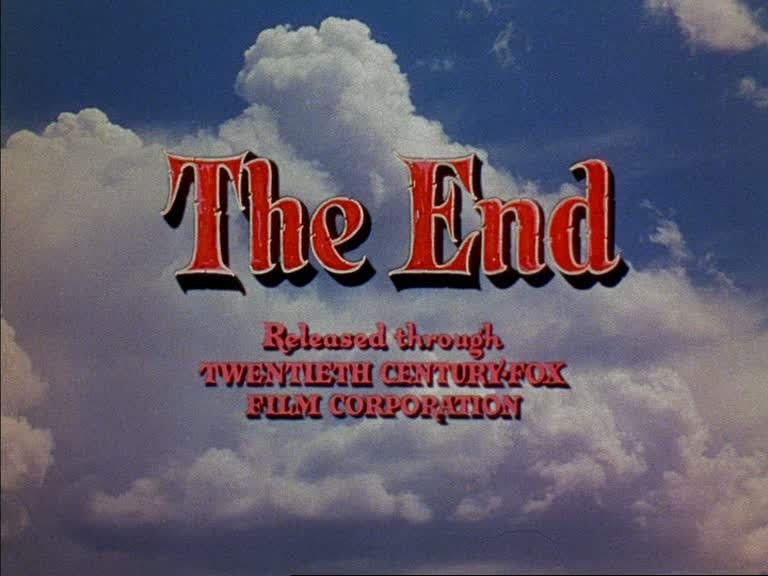 Colour rear projection was much more difficult to achieve than black and white. 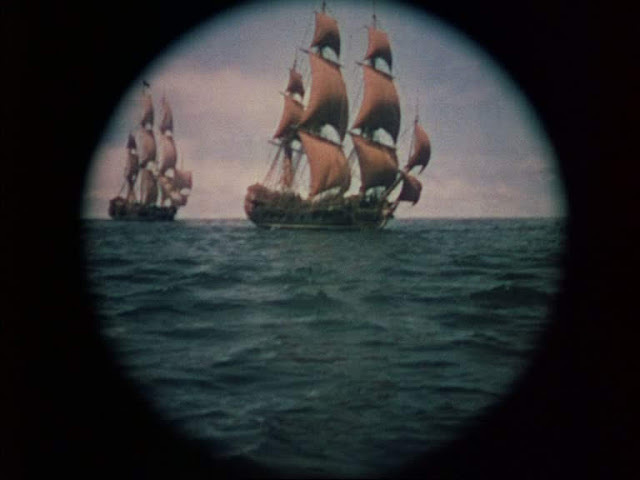 The Colour film stock was very "slow" having an asa of 5. It meant the projectors had to put out a huge amount of light. 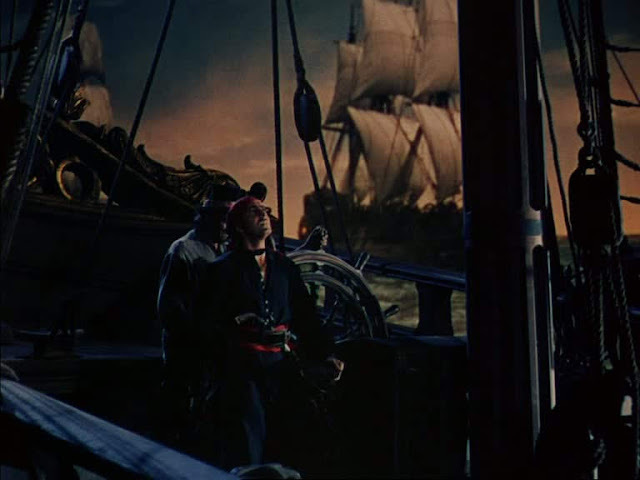 This was solved eventually by having three projectors all projecting the same background in sync at the same time, to achieve the necessary light output without melting the film. The other problem is that re-photographing colour film results in the colours shifting so the background colour no longer matches the foreground. 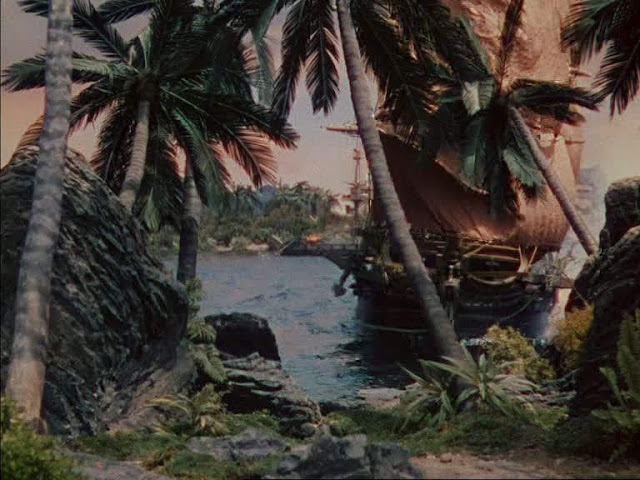 Grain is also increased and this is evident in the "process" shots here where the actors are in the foreground and the miniatures comprise the background. 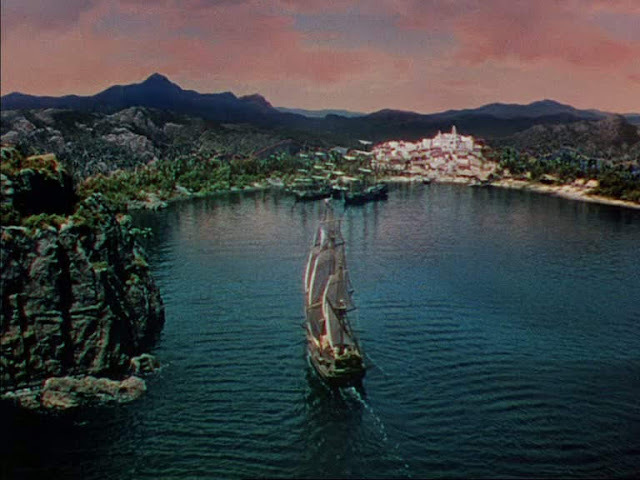 It also means that at least some of the miniature shots have to be photographed before principal photography. 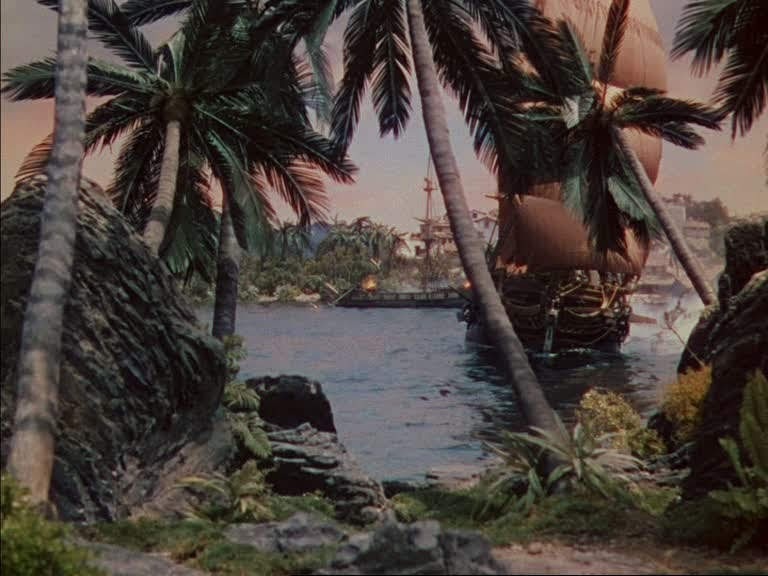 There are also a couple of shots where live action people have been matted into the miniature ship shots. 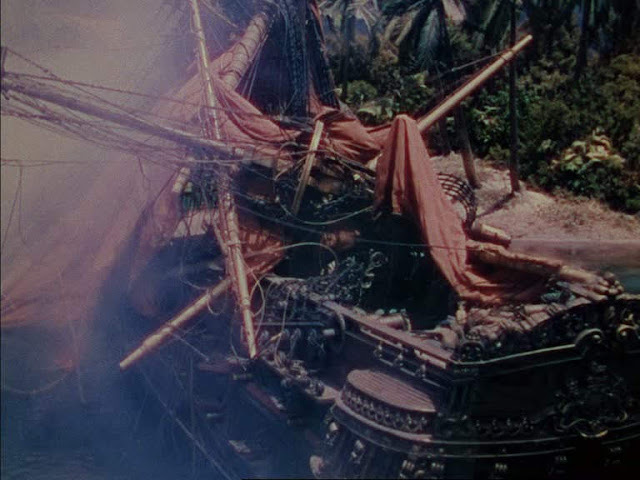 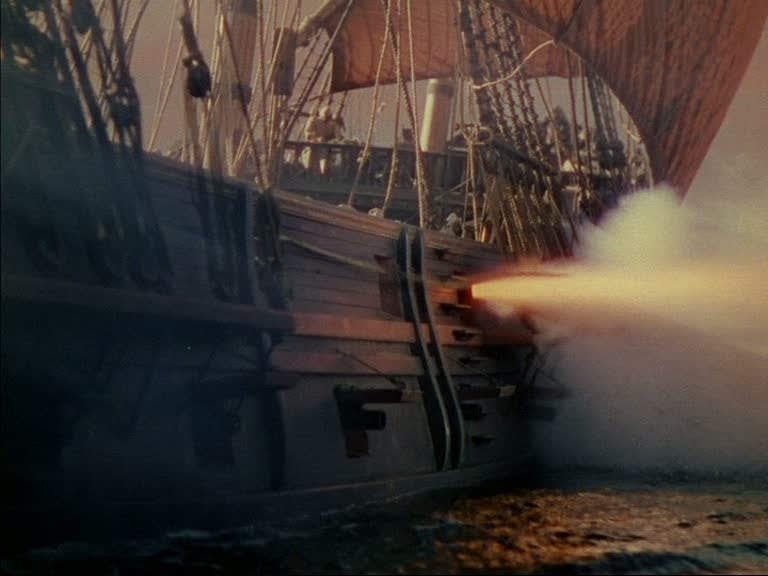 This is a technique Fred Sersen used a few times on various model ship movies, bringing to life the top down shots where otherwise the decks would be conspicuously bare. Live action pirates matted into the deck area of the model. 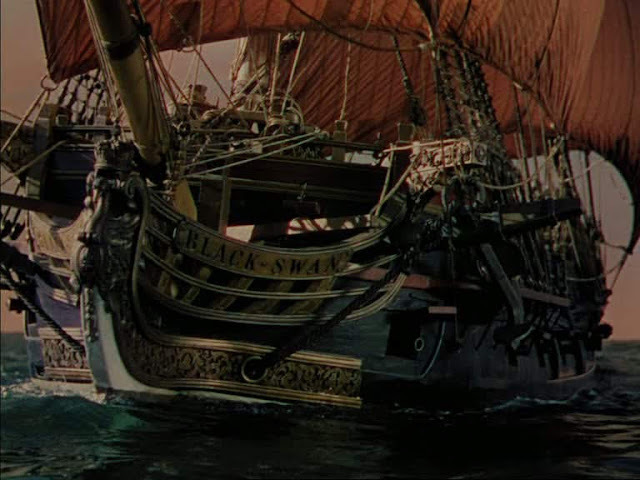 The ship Black Swan is beautiful. 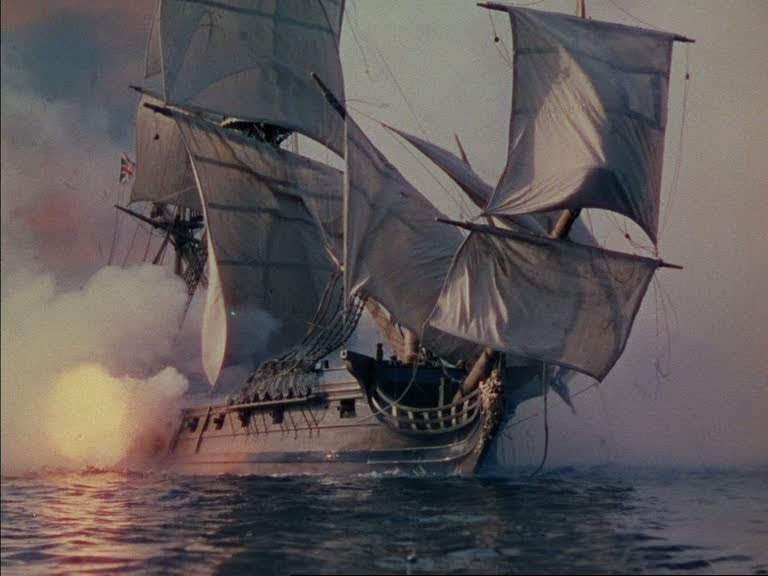 SHe is a 50 gunned frigate and beautifully built.